The freshness, the spontaneity and the genuine joy onstage with Bob Seger and Kid Rock were hard to argue with Friday at the Xcel Energy Center. But if these two Detroit rock heroes are going to tour together, let’s get organized. (Seger’s manager, Punch Andrews, was there along with big shots from Live Nation.) An 8 p.m. show for two bona fide headliners? And Kid Rock starting at 8:15, anyway. The concert –with Rock doing 75 minutes and Seger nearly 100 minutes -- lasting until nearly midnight? I may be speaking up partly because the deadline for my review for the Star Tribune print edition was 11:15. And the show ended about 11:53. But the night seemed long (or maybe late is a better word), even though it’s hard to complain about the performance of either star. 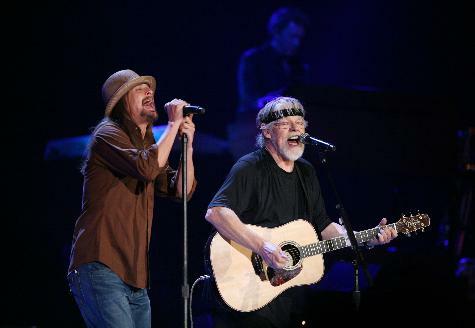 Seeming vital, cheerful and chatty, Seger was better than in his past two Xcel shows – his 2006 post-hiatus comeback and 2011. Leaning heavily on his rap-oriented material, Kid Rock was in good form but perhaps not as versatile and free-wheeling as he was at Mystic Lake amphitheater last summer or the Minnesota State Fair in 2009. Although my first hunch was that the crowd was more Seger-inclined, the response of the 17,507 fans seemed equally enthusiastic for both stars. All things considered, these two goateed Motor City men clearly have a special bond that should make a joint tour a no-brainer.